I’ve been looking for a product to help with my thin, fine hair for years. My hair has always been soft and fine since I was a toddler. I had perms in the late 80s and early 90s that made it appear thicker. Once the perm grew out, my hair had zero volume. It’s gotten worse as I’ve gotten older. My hair is thinner now than ever before and I hate it! I would lather my hair with mud if I thought it would help. I’m glad I don’t have to do that because there’s a product in the P&G family that I only heard about recently: NIOXIN. NIOXIN has been around for awhile and I’m surprised I hadn’t heard about it before. It’s the only salon brand with 20 years of expertise and solutions for thin-looking hair. I told my hairdresser that I would be trying it for my blog and she told me that she took a course on it and they used to sell it at the salon! I hope that was before I started going there because I wish she would have told me about it. Anyways! I got to try it out and so far so good! NIOXIN was developed by a mom who had experience thin-looking hair after giving birth to her first child. I’m part of that club too as are many of us. 75% of new moms notice more hair shedding than normal after childbirth. It’s just one of the fun things our body does after going through a pregnancy. Women can go from thick, healthy, shiny hair before a pregnancy to thin-looking and limp locks after giving birth. My hair was never thick, but it was a lot thicker than it is now. It’s the #1 chocie of hair stylists for their clients who want thicker, fuller and denser looking hair. Visible results are noticeable after just two weeks! I thought it was neat how NIOXIN takes an approach to hair care like you would see with skincare. They offer six customized sets depending on your hair type. Each set includes three parts: a cleanser, scalp therapy and treatment for daily use. Designed specifically for normal to thin-looking, fine, natural hair, System 1 includes a volumizing cleanser, lightweight conditioner and a leave-in treatment to refresh the scalp, amplify hair texture and deliver a healthy shine. Designed specifically for noticeably thinning, fine, natural hair, System 2 includes a volumizing cleanser, lightweight conditioner and a leave-in treatment to protect the scalp, amplify hair texture and deliver a healthy shine. Designed specifically for normal to thin-looking, fine, chemically treated hair, System 3 includes a volumizing cleanser, lightweight conditioner and a leave-in treatment to refresh the scalp, amplify hair texture and providing moisture balance to coloured hair. Designed specifically for noticeably thinning, fine, chemically-treated hair, System 4 includes a volumizing cleanser, lightweight conditioner and a leave-in treatment to protect the scalp, amplify hair texture and providing moisture balance to coloured hair. NIOXIN Cleanser System 4 (300 mL): Helps to remove follicle-clogging sebum, fatty acids and environmental residues from the scalp skin and hair. Cleanses to provide thicker-looking hair. 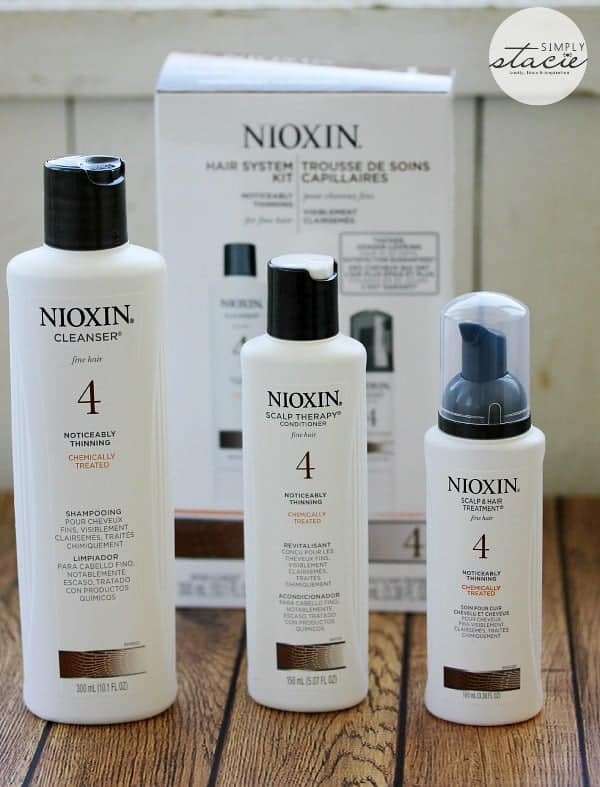 NIOXIN Scalp Therapy System 4 (150 mL): A lightweight conditioner that helps provide hair resilience and control moisture balance for noticeably thinning hair. 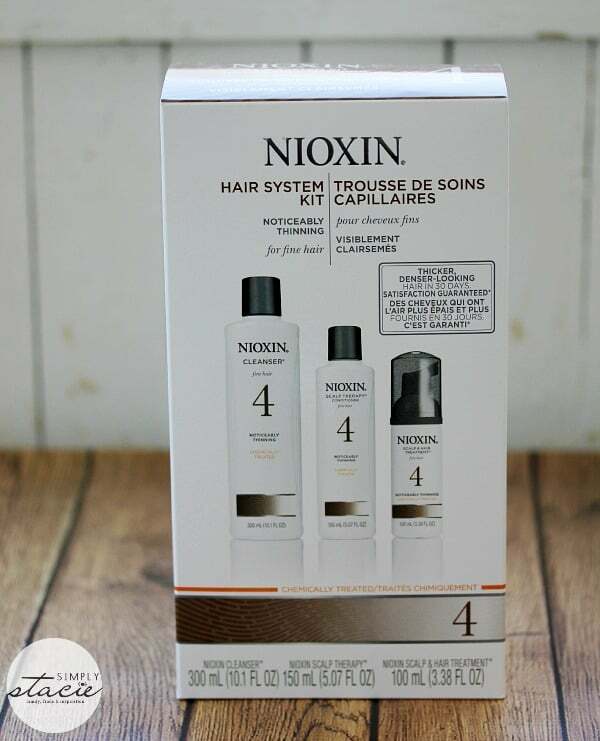 NIOXIN Scalp & Hair Treatment System 4 (100 mL): Contains antioxidants, botanicals and methyl nicotinate that helps to provide a refreshed scalp environment. It contains sunscreen to help protect noticeably thinning hair. You can learn more about the technology behind the system on the NIOXIN website. I like to know how things work and it was interesting to read how these products work together to achieve thicker looking hair. According to NIOXIN, healthy looking hair starts with the scalp! I’ve been using NIOXIN products since they arrived at my door on April 20th. The first time I used them I noticed that my hair looked healthier. It was shinier than normal. After a couple weeks, I started to notice it had more volume. My hair will never be thick, but it’s definitely doesn’t have that “see through” appearance when I wear it down. It looks fuller and definitely a lot healthier. I wash and condition my hair in the shower with the NIOXIN Cleanser and NIOXIN Scalp Therapy. Both products have a refreshing minty scent. The Cleanser (or what I call the shampoo) gives a rich, sudsy lather. I leave the Scalp Therapy (aka the conditioner) on my hair for about 2 minutes before rinsing it off. After towel drying my hair, I massage the Scalp & Hair Treatment into my hair and scalp. It tingles a little bit when I first put it on. I’ve got about half a bottle left of each of the products and I plan to continue to use them until I run out. Then I need to see where I can buy NIOXIN. I didn’t see any salons in my area that carry it, but I saw quite a few in Ottawa so I may have my mom pick me up more. Check the salon locator to search your local area for retailers. NIOXIN System Kits have an SRP of $45.99. I love that I could see a difference within 4 weeks! I learned they have 6 different systems to suit your hair type and needs. I learned that 70% of users of Nioxin notice thicker denser hair within 4 weeks. I learned that 70% of users notice thicker, denser-looking hair in just 4 weeks! They have a handy consultation tool for hair fixes on their site. I like that they have a consultation tool to help assess what would work best for you. My daughter is having a baby and I learned there is a product for new mums. I didn’t realize they have six different systems for different kinds of hair.